On this date, March 16, 1961, the Montreal Canadiens’ Bernie ‘Boom Boom’ Geoffrion became the second player in NHL history to score 50 goals in a season, in a 5-2 win over Toronto. His 50 goals tied a mark set in 1945 by Maurice ‘Rocket’ Richard. From The Hockey Writers Archives, written by former THW contributor Kevin Hunter and originally published on June 10, 2010. “Boom Boom” Geoffrion, born on Feb. 16, 1931, came into this world with his own royal lineage. His father Jean-Baptiste Geoffrion was a direct descendant of Pierre Joffrion and his wife Marie Priault, early French settlers to the colony of Montreal. Marie Priault was a King’s daughter. His ascension to hockey royalty would be earned on the ice. Coming out of High School where he played for Mont St-Louis, Geoffrion broke into the Quebec Junior Hockey League with Montreal Concordia, moved on to the Laval Nationales and finally the Montreal Nationales. Playing in the “Golden Age” of junior hockey, he immediately caught the eye of both the pro scouts and the hockey press with his thundering slap shot that would boom off his stick and rebound off the glass like a cannon shot. Charlie Boire, a hockey scribe for the Montreal Star, gave him the nickname “Boom Boom” that stuck with him throughout his career. Three teams represented Montreal in the QJHL, all playing out of the Forum: the Montreal Nationales, the Montreal Royals and the Junior Canadiens. Every Tuesday night at seven, a double-header featuring at least two and sometimes all three of the teams would pack the Forum to the rafters. A smooth and truly gifted Jean Beliveau would visit with the Quebec Citadelles. An intense, hard-driving Dickie Moore skated with the Junior Habs. Add to this the freewheeling Geoffrion displaying a heavy, hard shot the fans had never seen before, and then hold on tight, as the building would rock all night long. Along with Citadelles’ new goalie, Jacques Plante, these youngsters dominated the league. 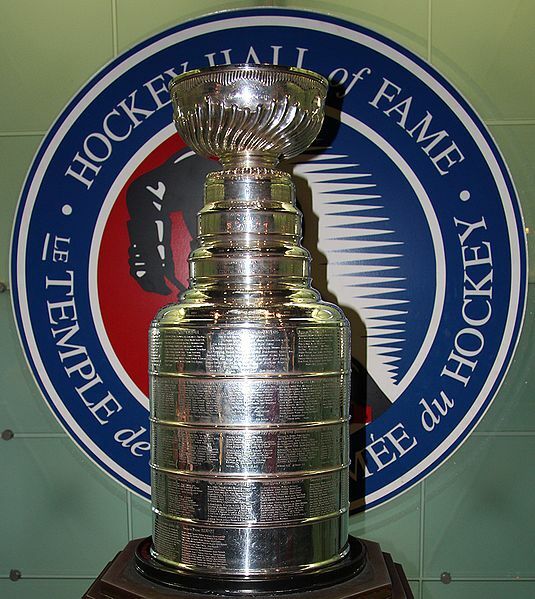 In consecutive years -1949 and 1950 – the Montreal Royals and the Junior Canadiens won the Memorial Cup, emblematic of the Canadian Junior Championship. During this pre-NHL period, at a Forum figure skating event where several junior stars were being introduced to the crowd, Howie Morenz Jr. introduced Bernard to his sister Marlene, by now an accomplished figure skater who was performing that evening. The couple hit it off instantly, started dating and the rest is history. They married shortly thereafter and were blessed with three children. On December 16, 1950, Montreal Canadiens’ general manager Frank Selke called up both Geoffrion and Beliveau to play against the New York Rangers to showcase these future stars for an eager fan base who had followed their young careers and knew their incredible potential. The Boomer did not disappoint, scoring the only Habs’ goal in a 1-1 tie. In all, he played eighteen games that year with the big club, scoring eight goals for a point total of 14. Entering the 1951-52 season, the Canadiens’ youth movement rekindled a spark in the team that had been flickering for a couple of years. Despite playing the year before, Geoffrion was still considered a rookie by league rules. Goalies throughout the league were amazed at his shot, not just the velocity of it but the heaviness as well. This was indeed a turning point in the game of hockey, one that would eventually lead to curved sticks, pucks breaking the glass and Jacques Plante donning the first mask. Though often criticized for its lack of accuracy, something every netminder in the NHL was well aware of, the slap shot was here to stay. Dickie Moore joined the Tricolore that same season, settling in on a line with Rocket Richard and Elmer Lach, finally solving the club’s problem of replacing “the Old Lamplighter”, Toe Blake. Geoffrion led the Canadiens in scoring that year with 30 goals and 54 points and won the Calder Cup as rookie of the year. By season’s end, the rookies had set the table for the feasts of the years to come. Montreal Canadiens fans from coast-to-coast. For the first time in NHL history, CBC-TV televised a live game between the Canadiens and the Detroit Red Wings. Fearing a drop in ticket sales, they were allowed to broadcast only the third period. At the start of the telecast, the score was 1-1 tie in a game that Montreal eventually won 2-1 on a goal by Billy Reay. The timing of the advent of television for Geoffrion and other newcomers to the team meant that their entire careers would be the weekly focal point for hockey fans all across the country. Hockey Night in Canada was born. By 1954, Jean Beliveau and Jacques Plante, both serious rivals from the Boomer’s junior days, had joined the Canadiens. Beliveau, Geoffrion and Bert Olmstead became a formidable scoring combination, with Olmstead digging pucks out of the corners and Beliveau and Boom Boom able to score from anywhere inside the opponent’s blue line. On March 17, days after Rocket Richard had been suspended by Commissioner Clarence Campbell for the balance of the season and the playoffs for hitting a linesman in an altercation with the Bruins, the restless crowd attending a Detroit-Montreal game hurled insults and invectives at Campbell as he sat passively in his regular seat at the Forum. As the anger grew to a fever pitch a smoke bomb was hurled to the ice and thousands of frenzied fans poured out of the building, forming into a mob that wound its way east on Ste-Catherine street destroying everything in its path. Storefronts, police cars, restaurants, and tramway cars were ravaged and set fire. The looting and burning lasted for hours. Police were unable to quell the trouble. Fearing the worst, management used local radio stations to broadcast a plea for peace from the Rocket himself. Eventually, the disturbance died out. This infamous event would forever be known as the Richard Riot. Richard was leading the league in scoring at the time he was suspended but, in the last game of the season, Geoffrion scored a goal to pass him and become the league’s leading scorer, giving him his second Art Ross Trophy. The Canadiens fans were distraught. 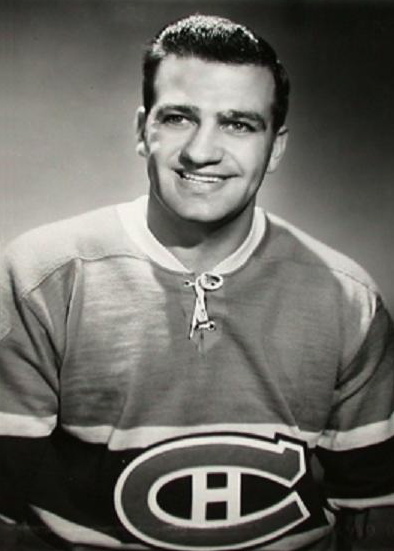 The booing and jeering that accompanied his latest feat pained Geoffrion, who, by now, was used to basking in the applause of his adoring Montreal fans. “I couldn’t NOT score,” he pleaded, but the fan rejection continued. Geoffrion, sensitive as usual to everything around him, started thinking of quitting the game. Richard and Beliveau interceded in a timely basis and he decided to stay on the team. Over the next five years, Les Canadiens won five straight Stanley Cups. Under new coach Toe Blake, in 1955, the team swept its league and most of the individual trophies. 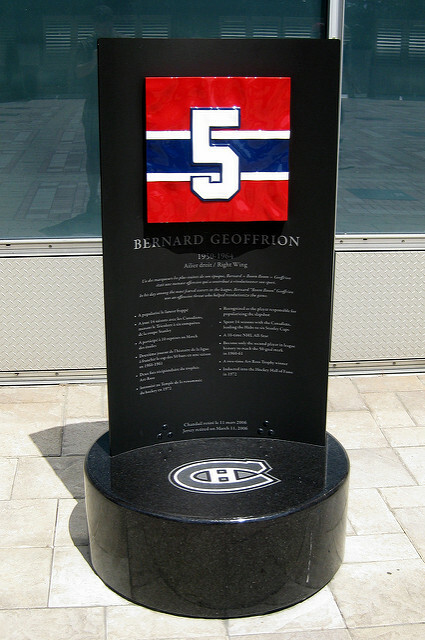 Geoffrion scored 62 points in 59 games playing on a line with Henri Richard and Dickie Moore. Trophy winners were: Jacques Plante (Vezina), Jean Beliveau (Hart), James Norris (Doug Harvey), Art Ross (Jean Beliveau). Plante and Harvey became perennial winners of their respective trophies while Geoffrion won both the hart and the Art Ross trophies in 1961, becoming only the second player in NHL history to score 50 goals in a single season. Both he and Beliveau were First All-Star Team picks that year. It is hard to argue with the man when you realize that ten players from that team are in the Hall of Fame: Jacques Plante, Doug Harvey, Butch Bouchard, Tom Johnson, Maurice Richard, Henri Richard, Jean Beliveau, Bert Olmstead, Dickie Moore and, of course, Bernie Geoffrion. In the summer of 1964, he accepted Frank Selke’s offer to retire as a player and to coach the Quebec Aces, the Montreal farm team. Believing he was on the path to becoming head coach of his beloved Canadiens, he reluctantly gave up his playing career for a shirt and tie and a spot behind the Quebec bench. After two years in Quebec, realizing that his dream job was not in the offing, Geoffrion returned to Montreal and was left to wonder about his future. He did not wonder long. In the summer draft, Emile Francis picked up Geoffrion’s player rights and he was more than willing to return as a Ranger. “I wanted to prove I could still play. The year before the Rangers did not make the playoffs. That season we did.” After one good season and a second in which his numbers fell off badly, Geoffrion finally retired as a player and again accepted an offer to coach. This time it was the New York Rangers. As a coach, Bernard was plagued by an oversensitivity to criticism and an active duodenal ulcer. Every time he ended up in a new coaching job, his stomach problems betrayed him. Despite his happy public face as a jokester and his polished manner as a raconteur, the internal drive for perfection that drove him throughout his playing career became his undoing as an NHL coach. In 1968, he could not finish the season with the Blueshirts. In 1972, he became the inaugural coach for the newly- minted Atlanta Flames. In his third season there, he was once again forced to the sidelines by ongoing stomach ailments. Finally, in 1979 he was installed by Irv Grundman as Head Coach of the Bleu, Blanc and Rouge. He figured to be home at last. Unfortunately, the dream job quickly turned into a nightmare. “I had three guys telling me what to do. Toe Blake, as Vice President of Hockey, traveled with the team. Claude Ruel was a coaching advisor while G.M. Irving Grundman also offered his input. Besides that, they were unfair to my son Danny. He had been a first-round draft pick of the Canadiens and they wouldn’t let me play him. I had dreamed about coaching the Canadiens but not like this.” After thirty games, with the team in first place, he resigned his post. Boom Boom’s son, Dan Geoffrion, played five seasons in the QMJHL for the Cornwall Royals. His junior career climaxed in 1978-79 when he scored 68 goals in 71 games and was drafted in the first round by the Canadiens. He played 111 games in the NHL, split between the Canadiens and the Winnipeg Jets. His game never caught fire and eventually, he retired and moved his family to Nashville. Dan’s son Blake, fourth generation Morenz, third generation Geoffrion and newest star on the hockey horizon is known as a defensive and penalty-killing specialist. Blake has already excelled on both the collegiate and Junior International stages and will return to Nashville soon, as a Predator, where he will write his own page in NHL history. As such, he will be the first homegrown hockey talent in Nashville’s brief history. Somewhere, sitting in the Royal Box, high above the Bridgestone Arena, a proud grandfather and great-grandfather will applaud his every move while they regale each other with war stories from their own illustrious careers. Joseph Andre Bernard “Boom Boom” Geoffrion played fourteen seasons for his beloved Canadiens. In 766 games, he scored 371 goals, added 388 assists for a point total of 759. He won six Stanley Cups. His jovial personality and natural flair for the comedic response made him a fan favorite. It was not easy to stand out in the crowd playing with Beliveau, the two Richards, Doug Harvey and Jacques Plante, but stand out he did. He passed away on March 11, 2006, just hours before the retirement-of-the-jersey ceremony was to take place. He insisted that the event should proceed and, that night, his family and friends along with 21,000 fans joined to celebrate his illustrious career. In an emotional salute, Howie Morenz’s No. 7 was lowered to half-mast where it was joined by Boom Boom’s No. 5 and together they were flown to the rafters to join those of their fellow retired Superstars. His wife Marlene and their three children waved goodbye as the jerseys rose high above the crowd. The adoring crowd did not miss this incredibly touching metaphor as they joined the family in saying their fond goodbyes. Not one person in the crowd doubted that the Boomer was there in the building that night, smiling that incredible smile and taking it all in.